Lately the teachers at Renshinjuku kendo dojo have been pushing the students to challenge themselves. They're getting as many students as possible to enroll in the dutch national champioships and they also want students to prepare for their exams. Sadly I can't join the NK (due to planning) and I don't feel I'm ready to take the exams either. Kris-fukushou confirmed this to marli, when they were having a chat while I was dressing: if I were to go for ikkyu now I'd definitely not make the grade, but if I work hard I can definitely give it a good shot next winter. And I will! I'll discuss the matter with Heeren-sensei, Loyer-sensei and both Hillen and Kris, to see what they think I need to work on the most. Saturday's class got off to a slow start. People came in a bit too late, so we only got things on the road by 0925. In the end, turnup was not bad with eight guys in bogu and about a dozen beginners without armor. We started with the usual warming-up, after which we quickly went into seiretsu. While Loyer-sensei took the utmost beginners aside, the novices joined the more advanced group for kihon practice. The guys in bogu acted as motodachi, while the novices practiced oki-men and oki-kote-men. Your left foot moves backwards while your shinai moves back just enough to get a clear shot. You fumikomi when striking and land about a foot behind where you started. The second strike is made with fumikomi in the exact same spot. The third strike is made in the same spot, with the fumikomi launching you backwards. As was said, if you overthink this then you'll just get stuck as I did. I tried to do the exercises in slow motion, but then everything fell apart. Instead, try it at 0.8 or really just 1.0 of the desired speed. The latter part of practice was spent on reacting to motodachi's men and kote attacks. We were free to try any techniques we like, so I focused on debana-kote, ai-kote-men and kaeshi-men. For those people joining the NK next week, we did short practice shiai. I fought Tiamat-sempai. In a shiai, don't lose the tension! Both Tiamat and myself went apart way too far, the inching back towards eachother. Instead, if the distance is too large quickly close in again to retain tension! As always, my chisai strikes were waaaaay too large. I keep moving the shinai with my right hand, instead of the left hand. Tiamat was warned that he shouldn't just keep slapping my shinai aside. Instead he should do something with it! Otherwise it's just useless movements and he's opening himself up for attack. Class was closed with some reminders from the teachers. Loyer-sensei warned the beginners that they're hitting with right way too much. This makes for huge movements, instead of properly small movements. Hillen and Kris-fukushou repeated the need for tension in a shiai. Stay close, don't let up! If something goes wrong, don't care and definitely do not show frustration. If you allow frustration to set in, you will ruin your chances. Before Sander's arrival I'd already sorted through Ton-sensei's bit bucket to see what's available. I had to get rid of a bunch of tsukagawa (handle covers) because they were covered in mold. Ditto for some of the sakigawa (tip cover). I quickly put everything into their own bags, to keep things tidy. We got started on our own shinai, after which we moved on to a bunch of loaner shinai from our dojo. My own shinai had a broken take, after last tuesday's horrible night. Luckily the take was recoverable after getting rid of the split-off piece. Obviously I'll let the guys at the dojo check it over first, to make sure I'm not putting anyone in danger. Sander's shinai were still in good condition, so he was done pretty quickly. Then! On to the loaners! While Sander worked on one of the adult's versions, I patched up the two kids' shinai. The first one went pretty quickly, but the second one provided a surprise! See the picture above: the sakigomu (a plastic or rubber stopper in the tip) had melted! I've never seen that before! 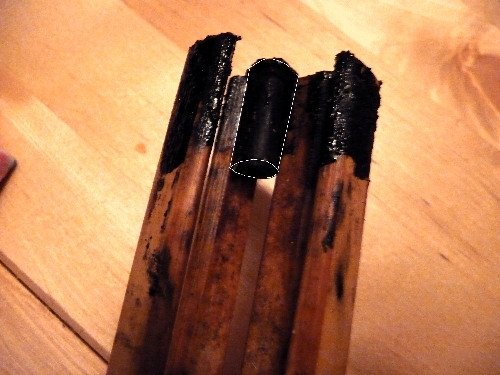 The molten rubber had cemented the take together and the sakigawa was also hard to remove. In the picture above I've outlined what was left of the rubber in white. The part that sticks out on top was completely gone! :D I guess someone left that thing lying right next to a heater or something. I managed to clean everything up nicely with some turpentine, but now I need to dig through the bit bucket to find another sakigawa in the right size. As I'd feared I had to bow out during kihon practice, because I was soo tense and out of breath that I'd keel over if I didn't. I don't know what was up yesterday, but all my muscles are/were tight as heck and my breathing patterns were a complete mess. Meh. So I quickly joined Roelof-sensei and Herman at the beginners' side. There I practiced oki-men, sayu-men and the semete-men movements we've been working on for the past weeks. Roelof-sensei remarked that I was using too much power in my strikes. Wouters-sempai found my footwork in kirikaeshi to be shoddy. She urged me to move from the hips and to be more precise: "More hips, less with the arms". Makoto-sempai noticed that I was taking an extra step when jumping to make a strike. This is very similar to the issues I've been having the past year, where I first dangle the right leg backwards instead of jumping in. In this case I first put weight on the right to only very slightly bring left further in, after which I kick off. That's wrong. I should be able to kick off immediately. Time to work on my kamae. Koseki-sensei pointed out that my sayu-men strikes were not off to the side enough, they were too much on top. During class I noticed that I'd cracked one of the take on my newer shinai. ( ;_;) I guess Roelof-sensei sure had a point when he said I was hitting too hard. I'll see if I can fix that tonight, otherwise I'll find another solution. When it comes to good stuff (it's not all bad), I've been writing a lot for the new Renshinjuku kendo dojo website. Aside from summaries of the classes I attend and some news posts about kendo events, I have also started a series of lexicographical articles. I know from experience that all the Japanese terms and phrases can be confusing for beginners, which is why I want to take the time to explain them. Of course there's the dictionary list compiled by our teachers, but that only provides translations and little explanation. First up in the series is an explanation of the various types of geiko ("training"). Next up, to be published on sunday, is an explanation of all the commands used during warming-up and the various types of suburi. In the near future I'll also write about the commands in seiretsu (plus some background on dojo layout) and about our equipment. After kata practice and warming up we quickly proceeded with kihon practice. Loyer-sensei took the newbies aside for the basics, while the beginners practiced men, kote-men and kote-men-do on motodachi in bogu. It gives me great pleasure to see that, in mawari geiko, the fundamentals of reiho are now falling into place. Beginners and advanced folks alike take the apropriate approach: bow (onegai shimasu), step into kamae, do your exercise, back into kamae, sheathe your shinai and step back, bow, then bow again when everybody's done (arigatou gozaimashita) and kotai towards the next partner. The beginners then joined Ton-sensei with the newbies for further kihon training, while those in bogu proceeded with waza. Chiisai kote-men, kote kote-men, men debana-kote, men hiki-men ai-men and men kaeshi-do. Each of these exercises was performed two or three times and in between were one-minute rounds of jigeiko to further practice. In all these exercises, Kris-fukushou reminded us of the importance of building tension, of proper footwork and of feeling the proper distance and chance to make your strike. Try to use different approaches in stepping in: sometimes edge your way in sneakily, sometimes boldly step and strike. In debana-kote don't simply step aside, but first step in when striking; then move aside. In both debana-kote and hiki-men keep your movements tiny, else you are simply too slow. With all these exercises it is imperative that motodachi give his best attack! Without a proper chiisai-men, you cannot practice a proper kaeshi-do! So don't just try and whack something, make it your best strike! Class was closed with three rounds of uchikomi geiko (third round was kakari geiko for those in bogu). Everyone was pitted against Kris-fukushou, Hillen-sensei, Raoul-sempai and Charl-sempai. At the end of class all three teachers had some closing remarks. Ton-sensei was amazed by how winded and tired a lot of people seemed in the last rounds of uchikomi geiko. Class wasn't too heavy and people didn't seem to be sweating too much. So why was everybody acting so tired? He also remarked that everybody's footwork went to pieces during these rounds. Hillen-sensei remarked how much his wrist and head were hurting: a lot of people are striking with strength instead of speed. You shouldn't be acting like lumberjacks! Snapping and striking, instead of slamming and shoving. He also thought that people were under the impression that uchikomi geiko needs to be hurried, especially when they have to do it in one breath. People started getting very sloppy! Instead, while it seems weird, you should be taking your time! By being more efficient and "clean", you are wasting less strength and breath. Kris-fukushou agreed with Hillen: people are lumberjacking! People are relying on their right arms and using strength. Instead, one ought to be using the speed in their left wrist and lower arm to make the "snap". In kata 4, Charl-sempai explained that uchidachi's thrust should end with the shinai almost lying flat on its side. He also mentioned that my hasso kamae was too vertical. More importantly, Charl-sempai also explained that in the first pose, uchidachi's shinai should also lie on its side when hidden behind your body. That way, you actually use the curvature of the blade to hide the length, instead of having to turn the point very far behind your back. It's hard to explain, so here's another approach: when going into uchidachi's starting position you move through hasso kamae into waki gamae. When moving from hasso, the bokken's movement ensures that your left wrist naturally tilts to the side meaning that the left side of the blade automatically points up in waki gamae. This is shown well in this video. As before, Kris-fukushou reprimanded me for my too-large movements. Stupidly, I really wasn't feeling what he meant and I honestly thought I was moving in a small fashion. Only near the end of class did it register! I was going through a slow motion chiisai men with Sander and I saw it: as always before, my kensen was already at head height way before striking and my hands were also raised. So while I thought I was improving, I'm actually still making the same mistakes as a year ago. Kris also made the same warming about my maki waza: my movements are too large and thus I both lose my opponent's shinai and the center line. I also realized that I was performing maki with my right hand, instead of left. Raoul-sempai took me aside to explain more about the left-arm issues we've been learning about in Amstelveen. He noticed that I was showing the same issues and he also knew why. I may be stretching my right arm correctly, but I'm doing to this high. In my case the right arm shouldn't be horizontal but a bit below that, which will allow my left arm to naturally stretch (this also affects the angle of my shinai!). By keeping my right arm horizontally I was locking my left arm and shoulder, through which I couldn't stretch it (without it severly hurting). Raoul-sempai also warned me that my kamae was still too tense. He kept urging me to relax. ... striking the men in the proper place. Too many of us strike the mengane instead of the top of the head. This does not count as yuko datotsu. ... holding the center. Too many of us swerve left/right on the upswing, thus losing the center. When striking, go up through the center and come down through the center. ... feeling maai. Before attacking, build tension between the two of you. Try to sense your distance and feel when you're at the right point to make a strike. ... proper receiving. If motodachi does not receive well, then one cannot properly practice. For example, in kirikaeshi hold your shinai vertically and snap it side to side. Don't hold your shinai diagonally as this completely misses the purpose of it all. After a further twenty minutes of jigeiko, class was closed with parting remarks by Roelof-sensei. In jigeiko he saw many people struggling, or being too focused on scoring points. Remember that jigeiko isn't necessarily practice-shiai. Jigeiko is meant to practice techniques you have learned. Don't focus on not being hit, instead do your best to try the things you learned in class. And if you're too tired, talk with your partner to make arrangements over who gets to try which techniques. Left hand, left hand, left hand. Too many people still over-use their right hand. During practice I also received some personal advice. Koseki-sempai found my kirikaeshi weird, insofar that I wasn't even hitting her men when she removed her shinai. Instead I was stopping a few centimeters above her head. Davin and I kept thrashing at eachother in jigeiko, trying to score points. Instead of just running into eachother like deer fighting for supremacy, we should maybe discuss what we'd like to practice. 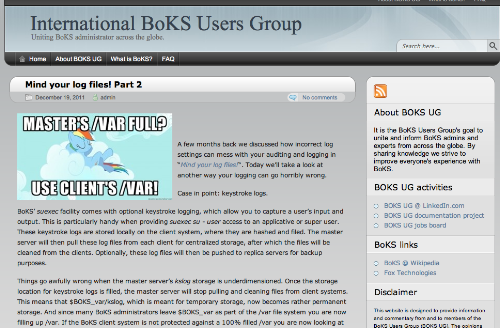 Hence Roelof-sensei's closing remarks for the whole group. Roelof-sensei demonstrated a useful strategy: by attacking kote in close proximity you can draw your opponent into a hiki-men, which can be answered using a kaeshi-do. Roelof-sensei noticed that on hiki waza I start moving backwards before bringing the shinai backwards. I shouldn't do that. First bring it backwards, then on the strike move backwards, otherwise you will be out of range. 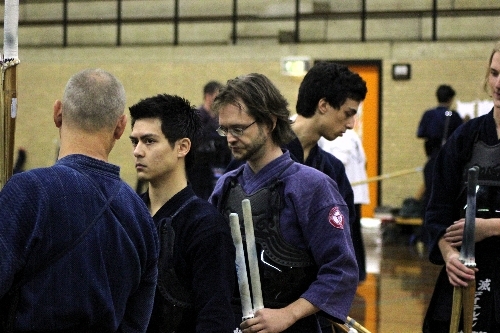 Looking at the picture Peter-sempai shot of me, waiting in line for the shinai check, game me a sudden glimpse into my future. Will I look like Roelof-sensei in thirty years? The Fumetsu Cup, as described by the NKR in the invitation: "The Fumetsu Cup is the yearly held surprise tournament in which all participants are randomly divided into teams of three persons. With their team they will compete for the cup. Teams will be captained by an experienced kendoka." It's great fun because you get to meet people you normally might not and you're driven way out of your comfort zone. Instead of fighting with kendoka from Renshinjuku, my team was pitted against one of them. Unfortunately the last sentence of the description wasn't true for my team as all three of us were mudansha: combined we had about five to six years of experience and none of us even had our ikkyu. Hence why we were outed from the tournament after our three fights in the first round. Oh well :) I enjoyed teaming up with Kerstin (from Museido in Amsterdam) and Erik (from Shinbukan in Groningen); they were great people to meet and I learned from them in the short time we spent together. In my three fights I matched up against Laurens from Suirankan, Ms Cha who at one point used to be with the UK Hizen dojo and Wim from Shinbukan. I really should have done a short practice round before the actual matches because I had the same problem that Kerstin had described: in the first fight I'm still "asleep", not properly alert. With Laurens I was wide open. I fell to a few neatly performed and by-the-book men strikes. My kamae wasn't properly closed and I was being pushed around by his seme. He dealt with me quickly and neatly. With Ms Cha things were a bit different. I had seen her fight in the round before and I was well impressed! She's a veritable powerhouse, a "small ball of fire and lightning" as I described her to myself. She's assertive, she's strong and she does not get pushed around! I'm very happy to have lasted against her for a few minutes, but that wasn't down to my skill. With Wim I felt that we were more evenly matched, though that might be completely off-base. I remembering feeling pleased to match up against someone else wearing glasses :D I also recall being more aggresive myself, though my sloppy kendo prevented me from scoring any ippon. I also recall dodging a lot (always to the right) and I think that I lost with one-against at the five minute mark. Afterwards I asked some of my sempai for their opinion on how I'd performed. Kris: "You didn't do anything that I told you to!" My movements were large, instead of small. I danced, instead of pushing through. My kiai wasn't strong enough and I had no fumikomi. Peter: "I can see you coming miles away, we all can. It's like your phoning home: honey I'm on my way!" Nick: "Your kamae might've been closed at times, but it wasn't strong. You weren't showing strength." Zicarlo: "You tend to slouch fowards." I've had a chat with Wim and he remarked that I showed good kiai and that I was plenty greedy. I'll view the prior as a good thing, but the latter could swing either way. I could have been too greedy, like last time, or I could have shown proper assteriveness. While walking to the office this morning I did have a realization: one of the worst things I was doing, was not stonewalling my opponents' attacks. Either I sidestepped and counter attacked, or I kept moving backwards to evade. Instead, I should receive their attacks in place and counter immediately.